According to the report, 44.83 per cent of all claims filed were accepted, while 45.90 per cent of all claims were rejected. In addition, 9.27 per cent claims remain pending. 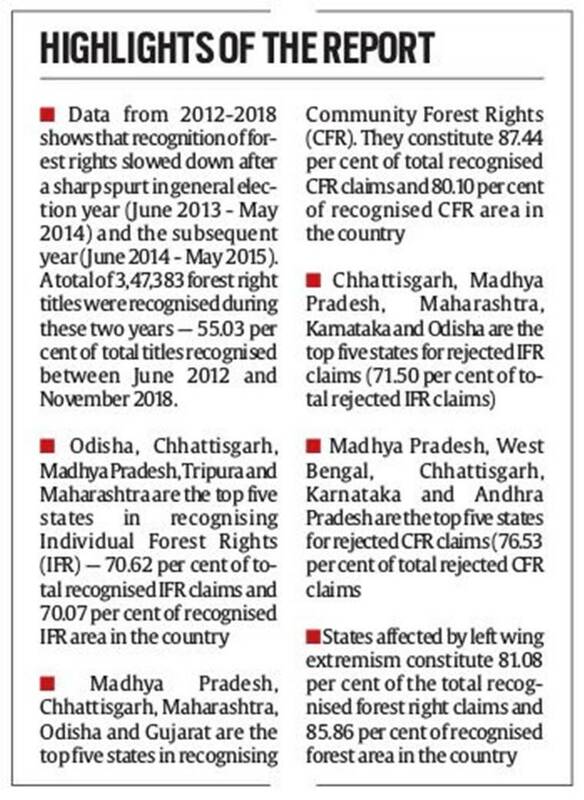 Of all claims filed by forest-dwelling communities seeking recognition of rights over forest resources as guaranteed by the Forest Rights Act, 2006, rejected claims outnumber recognised claims. In addition, no consolidated database exists on how many rejected claims went in for appeals as per the law, and how many claims were rejected again at the appeal stage, finds a report released by Tata Institute of Social Sciences on Friday. The report has been compiled by faculty members and research scholars of TISS, who have been documenting the implementation and impact of the Scheduled Tribes and Other Traditional Forest Dwellers (Recognition of Forest Rights) Act, 2006, across India. It comes at a time when forest-dwelling communities in pockets across the country face uncertainty in the aftermath of the Supreme Court’s February 13 order, later stayed, to evict forest dwellers whose claims were rejected. According to the report, 44.83 per cent of all claims filed were accepted, while 45.90 per cent of all claims were rejected. In addition, 9.27 per cent claims remain pending. In total, forest rights have been granted for only 15.29 per cent of the minimum potential forest area where rights can be recognised. The Act recognises the historical injustice suffered by STs and Other Traditional Forest Dweller (OTFD) communities and seeks to restore the rights of such communities over land resources. Previous studies have pegged the forest land over which forest dwellers’ rights may be recognised at over 100 million acres in 1,70,000 villages — a quarter of India’s villages. On the very large number of rejected and pending claims, the report notes that claimants are routinely not given in writing the reasons for rejection; the sub-divisional level committees (SDLC) and district level committees (DLC) do not make serious efforts to procure required documents and information for gram sabhas to file their claims; regular meetings of SDLC and DLC do not take place; and claims of the OTFDs are arbitrarily rejected or not processed, provisions for recognising OTFDs’ rights routinely misinterpreted and misunderstood. “These and several other reasons have not been discussed and brought to the notice of Supreme Court in the ongoing petition challenging the claims of forest dwellers,” the report states. “In the light of above problems in the implementation of the Act, it is very important to revisit the current mechanisms and institutional arrangements in addressing the increasing number of rejected and pending claims”. “While previous reports have documented reasons for ineffective implementation of the law, the effort this time is a countrywide comparison of various states in recognising forest rights claims and addressing pending and rejected claims. The report also has a special focus on Scheduled V states and states affected by left wing extremism (LWE),” said Geetanjoy Sahu, assistant professor at TISS School of Habitat Studies, and co-author of the report.